Sophomore Breda Vosters scored her first goal of the NCAA tournament on Sunday against Stanford. Battling furiously near the front of the cage, Stanford's Annika Dries received a perfect entry pass - only to find herself swarmed by four Cal players. Even eight defenders may not have been enough to contain the sophomore two-meter, who shrugged off the pressure and rifled the ball in the net anyway. Despite their best efforts, the Bears' could to little to overcome a dominant Sunday afternoon from Dries. 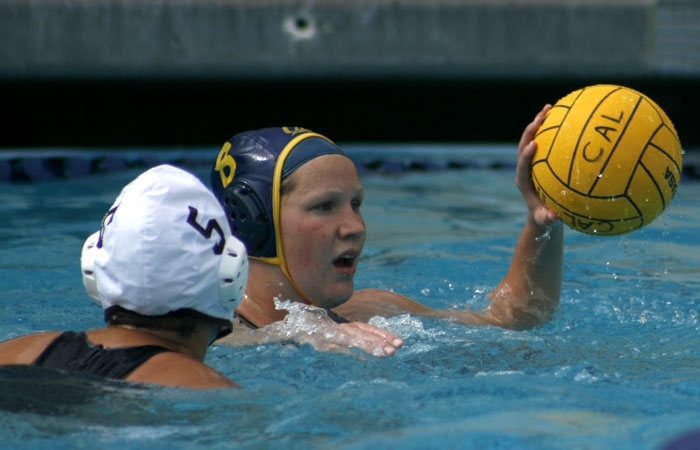 The Laguna Beach, Calif. native poured in a game-high five goals at Michigan's Canham Natatorium, leading the top-ranked Cardinal to a 9-5 victory - and forcing Cal to settle for runner-up in the program's NCAA title game debut. Dries made her presence felt from the get-go in the national championship match, putting in the game's first two goals - including a score on the Cardinal's opening possession. Before the contest was one half old, she already had herself a hat trick. "She just came out ready to play ... she did a really good job," Bears driver Breda Vosters said. "And we were prepared, but probably didn't entirely put it all together." Just as key as Dries' offensive showcase was a pair of costly second-quarter miscues by Cal. After one quarter of action, the Bears found themselves in perfect striking distance, trailing just 2-1 and playing with renewed defensive intensity. But in a matter of minutes - and inches - that ideal scenario became an insurmountable deficit. With 2:11 remaining before halftime and the shot clock winding down, the Cardinal's Kim Krueger fired a desperation skip shot from longh range that snuck past the fingertips of goalie Stephanie Peckham. The Bears' Emily Csikos, who tallied hat tricks in her first two tournament games, short-armed a penalty shot - only to have Dries respond and turn the missed opportunity into a breakaway goal on the other end. That sequence gave Stanford a 4-1 edge, which later ballooned to 7-2 in the second half. "(The Cardinal) is just a team that doesn't make a lot of mistakes," Vosters said. "If we just stay composed and keep our heads, it makes it a very different game, but there were a couple of times where we panicked ... I think (those two plays) definitely put momentum in their favor, and that's hard to come back from." Still, the Bears certainly put together a valiant rally late in the second half. Vosters and Elizabeth McLaren each found the back of the net with long distance shots, closing the third-quarter gap to 7-4. Freshman two-meter Katie Monton made the score 8-5 in the fourth period, but Cal would get no closer against Stanford keeper Amber Oland. The Cardinal's senior goal-tended turned away 11 shots on the afternoon. "It was a rough game for us today, but I am not going to let our last four quarters dampen what was otherwise outstanding season," Cal coach Richard Corso said after the contest. "This is the best finish this program has even had and I am so proud of what we were able to accomplish. This season was a lot of fun." Ed Yevelev covers women's water polo.